Who Owns the Moon, and Can I Buy It? Since the earliest days of human civilization, people have looked up at the moon – that familiar-yet-distant, silvery disc hanging suspended amid the velvety black curtain of the night sky, surrounded by the twinkling lights of billions of distant stars – and engaged in broad, abstract speculation. Where did the moon come from? What is it really like up there? And what does it say about people that the moon holds such a grip on our collective imagination? Unusual events like the upcoming supermoon eclipse, the “Super Blood Wolf Moon,” further stoke the fires of imagination. This is a real estate blog, however, not a philosophy one, and for that reason, we would like to ask (and then answer!) a question that is a bit less esoteric: Who owns the moon, and can I buy part of it? Even though America planted a flag on the moon when Neil Armstrong took his “one small step,” that flag was not meant as a territorial claim or the establishment of a lunar colony, in the manner of the explorers of old. Due to concerns about international reactions to any perceived misuse of a celestial body, in 1967, the United States, United Kingdom, and Soviet Union signed an agreement that is known today as the Outer Space Treaty. This document, which you can read here, still serves as the underlying foundation for international space law. It forbids countries from appropriating portions of space, including moons or planets, and prohibits many kinds of space-based military activities. Today, more than 100 countries are party to the Outer Space Treaty, including all of the major space-faring powers. The issue of mining is more ambiguous, as the Outer Space Treaty did not clearly address the commercial exploitation of space, stating only that these resources should be used “for the benefit of mankind,” without specifying what that would involve. A subsequent accord from 1979, commonly known as the Moon Agreement or Moon Treaty, attempted to clarify the issue, but it was not widely accepted by the international community. Some countries, including the United States, treat the moon and other celestial bodies as a “global commons” that is owned by no one but free for all to use, as long as that use does not conflict with international law. By that standard, private operators could mine resources from the moon and sell them for profit, as long as they were duly licensed and in compliance with other relevant international laws. Other countries, most notably Russia, believe that celestial bodies are the collective property of humanity as a whole, and that any harvesting of their resources must be subject to an independent international body to ensure that the proceeds from such must be distributed fairly among all humans. Existing treaties also permit nations to exercise temporary control over the area immediately surrounding a landing site, which would conceivably include limited mining operations. As interest in space mining continues to grow, it is likely that these issues will be settled in the not-too-distant future. OK, so countries can’t really own the moon. What about private citizens? Frederick the Great, an 18th-century King of Prussia, bestowed the moon to one of his subjects, a folk healer named Aul Jürgens, in gratitude for services rendered. In 1937, a man named A. Dean Lindsay filed documents with a notary public in Pittsburgh, PA, claiming ownership of “the property known as planets, islands-of-space or other matter, henceforth to be known as ‘A.D. Lindsay’s archapellago’ [sic]”. In similar fashion, an unemployed entrepreneur named Dennis Hope attempted in the 1980s to claim ownership of the moon by writing to the United Nations and calling dibs, unless it wrote back and told him that he couldn’t. It never did, and ever since then, he has busied himself by selling “deeds” to more than 600 million acres of the lunar surface. All such claims are legally dubious at best, and should be viewed with a jaundiced eye, though it is easy to understand the appeal of the dream. 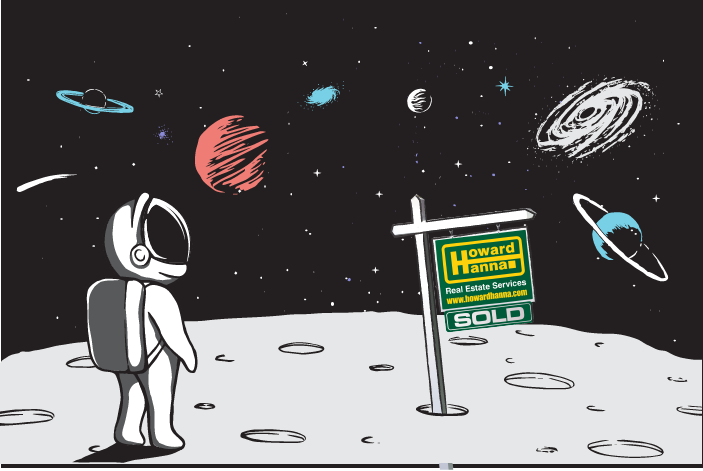 Howard Hanna may not be able to sell you a piece of the moon, but we have plenty of properties that are out of this world! Visit HowardHanna.com for information on our exclusive tools for buyers and the ways that One-Stop Shopping can make your home purchase a smooth and stress-free process.